This is the bulk storage tank for the LPG used on this site. 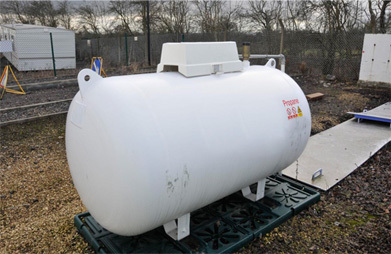 For the type of installations covered in this example, this tank can store up to four tonnes of LPG. In some cases, more than one tank may be used to store the LPG. In the vast majority of cases the tank will be owned by the company that supplies the gas, but if you are unsure then you should check this with your own supplier. In general, the supplier will look after the tank and its fittings (their integrity and maintenance) but again check this with your supplier if you are unsure, as legally it needs to be maintained in a safe condition. The legal framework provides more information on the background to these responsibilities. There should be a minimum distance (called the separation distance) between the tank and any building, boundary line or fixed source of ignition. This should have been checked when the tank was first installed and the supplier will know what the distance should be if you are unsure. Modifications to the area may have been made since the tank was installed. These could include altering walls, building sheds or fences, installing electrical equipment near the tank or planting trees or shrubs nearby. These should not be any closer to the tank than this minimum distance and, if they are, then arrangements need to be made to move them. There should not be any drains or gullies near to the tank unless a water trap is provided to prevent gas entering the drains. This is because LPG is heavier than air and if a leak were to develop from the tank or its controls or pipework or when it is being filled then the vapour could accumulate in an untrapped drain or gully. Ignition of these vapours could then lead to fire/explosion. The tank should also not be painted in any colour other than originally supplied as this may increase the amount of heat it absorbs from the sun. In case of leaks there should be plenty of room around the tanks to ensure good air flow so that pockets of heavier-than-air LPG vapours cannot build up around them. There should be a dedicated flat parking area for the tanker delivering LPG. This parking area should be clear on a delivery day and people should be kept away from the tank and tanker while the transfer of LPG is taking place. The supplier of the LPG will need to make sure that the tanker cannot drive away with the supply hose still connected, that there is no risk of an electrical spark being generated from static electricity or by other means. The LPG suppliers should ensure that their drivers are suitably trained and have the correct procedures to follow. People not involved with the installation, for example workers with no responsibility for the LPG or visitors to the site, should be kept well away from it. No one should smoke, use electrical equipment or park vehicles near the tank . ‘No smoking’ and other signs should be clearly displayed and maintained. Ignition sources, eg bonfires and barbecues, should not be allowed near the tank. Temporary use of grass-cutting equipment within the vicinity of the tank is permitted. 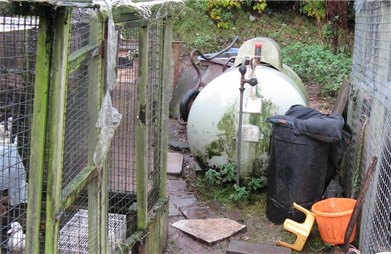 The tank should be protected from unauthorised access to reduce the chance of intentional or accidental interference. For larger tanks (ie four tonnes or higher LPG capacity) a security fence is required to keep it secure. This fence should allow natural air flow (eg made from wire mesh) and should be kept in good condition. Any gates should be kept locked unless access to the tank is required. 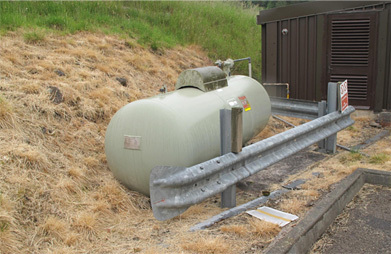 For tanks below four tonnes LPG capacity, there may be certain circumstances where a fence may not be necessary. This can only be justified where the risk of interference is low, and there is no uncontrolled public access - for example due to tank location or other accessibility factors. 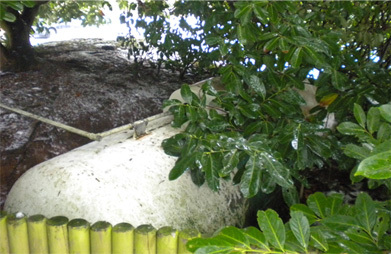 Tank valve covers should be kept locked whether or not the tank is fenced. If possible, the tank (and its associated piping) should not be located in areas where there is motor traffic. 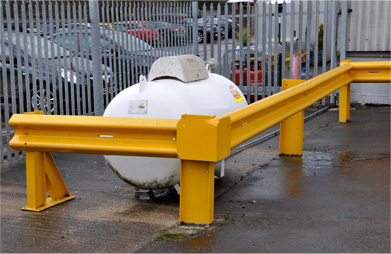 However, where this is not possible, then protection from a motor vehicle hitting the tank is required such as crash barriers or bollards. A security fence and/or road markings (eg ‘no-parking’ notices, double yellow lines) are unlikely to provide this protection. The LPG tank will have printed on it the supplier’s emergency number that should be called if there is a leak. If a fire breaks out then the user should have in place an emergency plan which includes evacuating people from the premises. In general, leave tackling any fire near the tank to the fire brigade unless it is judged that it can be put out without endangering anyone. In the event of an emergency, and where it is safe to do so, the shut-off valve on the top of the tank and the emergency control valve (ECV) should be closed.